The water. I just love everything about it. I am most at peace when I am sitting by the water. Some of my clearest memories from my childhood are swimming with my mother. I learned my love for the water from her. Yet, I am not an accomplished swimmer. I am a capable swimmer. When I was at my heaviest, the pool was one of the few forms of exercise I could manage. I felt weightless, with no pain or stress on my body. At my size, there wasn’t much else that I could do without fear of injury. 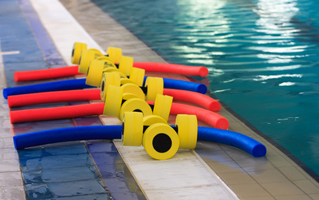 When I first joined in 60/60 at Dedham Health, one of my favorite benefits was the access to the pool. I was interested in taking a group fitness class, but because of my size, wasn’t sure which classes I could handle. 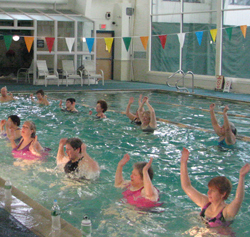 My exercise physiologist Jason taught a water class. Maybe one of his classes would be a good place to start. But I was afraid. I’m not very good at trying new things. One night, a friend of mine who also belonged to DHAC decided to take Jason’s water class. I accompanied her to the pool, but I was too nervous to join in. What if I couldn’t handle it? So I stayed in the background and observed. There were people of all sizes having a great time and getting a good workout. Maybe I could do it after all. Eventually I found my way into class. Yes, there is a stereotype about water classes. They couldn’t be further from the truth. These classes are a very good workout! At the end of an hour of tuck jumps and torpedo hops and double hamstring curls, the class is spent and happy. We have A LOT of fun in those classes. The music is great (people are often singing along) and the participants have formed a little community. Many of the friendships that I have made at Dedham Health were formed in the pool. We have a lot of laughs together and with the instructors. It is such a warm and welcoming environment. Obviously, I am quite excited for the Aqua Challenge V (Rock Waves) on Saturday November 19th. This will be my first, but others in the water classes rave about this event! Many of us have already signed up and are ready for a super-sized class and a great workout. If you have been thinking about trying a water class, I cannot think of a better day to start then the Aqua Sculpt Challenge on the 19th. Sign up at the front desk and come join us in the pool! And don’t say I didn’t warn you about those double hamstring curls! For the past few weeks, you may have seen our Facebook and blog posts about Rock the Waves. I’m happy to announce that this Saturday, November 19, we will host our fifth annual Aqua Sculpt Challenge. The event is held in the Adult Pool between 11 AM – 12:30 PM. We are opening the entire pool for this class. Last year, we had about 75 people, and the pool still had a little space left. This year, we are looking to squeeze in about 85 people. We have a sign up sheet available at the front desk, and you’ll see signs throughout the club. This class will probably fill up fast – it’s one of the most popular classes we have, so don’t delay. Sign up ASAP. This year we have a musical theme. We are featuring your favorite songs from every decade over the last 60 years. The top vote-getters from our Rock the Waves surveys will be the songs played while Brittanie and I rock you for the workout of a lifetime. Missed your chance to vote? Don’t worry! Click here to see all the surveys from the past two weeks. Vote as often as you like, and tell your friends to vote, too! This year, let’s rock the pool! If you have any questions, come see me in the fitness center.